1. To bring to the attention of Chicago the very poor statistical performance of the city on basic demographic and economic measures. 2. To write a corrective to the many national puff pieces that have been written on the city that totally overlooked its real and serious problems. As it turns out, Rahm Emanuel’s own economic plan and the OECD report beat me to the punch on point #1. As a lot of what I wanted to accomplish with State of Chicago was data oriented, my project is now much less ambitious than I’d originally intended since Chicago’s leaders are now, fortunately, owning up to the problems. Today I want to start out by giving the prequel to my article: Chicago’s Rust Belt decline and subsequent comeback, particularly in the 90s. I think everybody knows that cities had a rough 70s and early 80s. It was the “Rotten Apple” era in New York, for example, a time of needle parks, mugger money, graffiti trains, a brush with bankruptcy, and much more. Chicago had a similar rough patch. When Richard Longworth (now of Caught in the Middle and Global Midwest fame) returned to Chicago in 1976 from many years overseas as a foreign correspondent for the Chicago Tribune, it was to a grim, decaying city that, like so many big cities in America at the time, clearly was a city that did not work. This was perhaps best symbolized by the city’s inept response to the Blizzard of ’79, which left the city paralyzed for days. Mayor Michael Bilandic’s blizzard response was widely credited for his subsequent re-election defeat. Old mayor Richard J. Daley’s City Hall alliance with business had preserved the Loop as a powerful, if somewhat drab, business district while so many other Midwest downtowns fell into ruin. But otherwise Chicago was a troubled, declining city covered by a veneer of boosterism. The city was losing people, losing businesses, and losing jobs — even in the Loop. Manufacturing was collapsing and the middle class was fleeing, leading to neighborhood decline and eroding the city’s tax base, which in turn degraded the city services residents had come to expect and demand. The decline in services and neighborhoods drove more people way, which led to further declines, perpetuating a vicious cycle. The city was failing on nearly every measure. I was struck by how similar Longworth’s litany of statistics were to my own. There was a big different however: back then things were way worse. Today the problems of Chicago take place against a backdrop of many areas of strength in the urban core and a secular uptrend in the fortunes of cities. Given that Chicago has come back from far more dire circumstances than it faces today, there’s reason for optimism in the present. As I noted in City Journal, during the 90s (probably starting in the late 80s), Chicago had a massive comeback. It gained people, it gained jobs, and the core reasserted itself. I moved to Chicago in 1992 when only a few select lakefront precincts were really gentrified. Though I lived in Lincoln Park, I was told not to move west of Racine, not because it was dangerous, but because it was dead. The area where I used to live near Belmont/Ashland/Lincoln was completely boarded up except for the Army-Navy surplus store. Recruiters for my company tried to sell me on the city by telling me it was now a location of the uber-hip coffee chain Starbucks. I watched vast tracts of the city transformed before my eyes. The 90s boom was real. I saw it. I felt it. It also showed up in the data. I don’t want to go too crazy, but I wanted to look at some economic statistics. First, I want to look at metro area job growth in the 1990s for selected cities. I’ll show the percentage gains in a moment, but here’s the raw job growth for the ten largest US metros during the 1990s. (Top ten selected based on today’s 2010 census population). 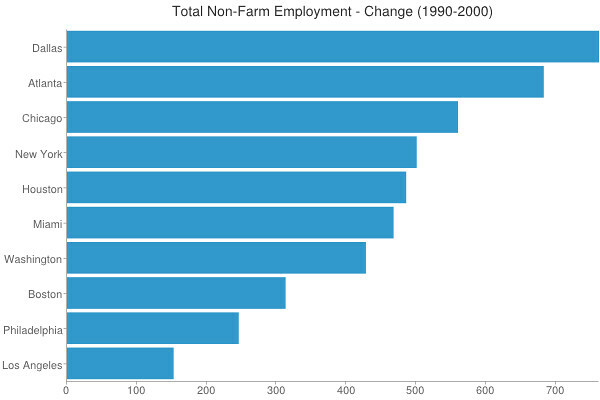 Chicago actually had the third highest total job growth. Not only did metro Chicago outgrow New York and crush LA (which got bruised by the “peace dividend”), it actually added more total jobs than Houston, everybody’s darling today. Wow. And more than currently booming Washington, DC. In short, Chicago beat out its mature tier one peers while holding its own with the emerging boomtowns. Very impressive. Not as impressive vs. the emerging cities, but Chicago held its own with Boston (a big beneficiary of the dotcom boom) and more than doubled up traditional peers New York and LA. I think it’s fair to label Chicago an outperformer here. Boston topped out, perhaps to be expected from the dotcom boom. But Chicago beat NYC and LA again, and also Washington, DC. (Interestingly, the southern boomtowns that did well on this metric in the 90s mostly got killed on it in the 2000s, Houston excepted). So I think it’s fair to say that compared to its large mature peers, Chicago economically was the winner (or at least near the top depending on who you put in there) during the 1990s, along with Boston. This is the type of performance Chicago is capable of delivering. But beyond the statistical measures, there were many qualitative improvements as well. For example, Chicago was really the early leader in quality of space. After Mayor Daley’s famous trip to Paris, he came back and encased the city in wrought iron. He also put in miles of streetscapes, with median planters, new streetlights and the like. (I happen to think the aesthetic style of these was not appropriate to Chicago, but they clearly upgraded the city in a big way). The CTA saw a brand new L line open to Midway Airport. New cultural facilities blossomed. For example, both the Chicago Symphony and the Lyric Opera undertook $100+ million building projects. And Daley even brought political stability back to the city after the turbulence Bilandic-Bryne years and the racially driven “Council Wars” of the 1980s. In a post-Cold War global order, Chicago also emerged as a global city. No longer just a superpower of the American interior, Chicago came to play a critical role in the global economy, through its derivatives exchanges, its professional services complex, and its status as a transport and cultural hub. Globalization became the lens through which the city sees its role in the modern economy, and with some justification. By 2010, Foreign Policy magazine ranked Chicago as the sixth most important global city in the world, for example. Chicago began to regard itself no longer as merely the “Second City,” but as a global player in its own right. So in the 1990s, Chicago was riding high. Little did the city know that with the dotcom collapse and the national economic trends of the 2000s, the city was about to enter a tailspin. But there was clearly a lot of real progress and change in the city and a lot for the city to feel good about and be proud of. Chicago was the big city champion of the 90s. I don’t want that story to get lost and people to think I’m just picking on Chicago. I’m happy to shout out its accomplishments when merited. But when things aren’t going so well, the city likewise deserves people who are willing to tell the truth. In the next installment, we’ll expand a bit on the troubles. I’ll wait for your next installments, but one of the interesting questions here is time frames. Can you really say that a city has become “global” ten or 20 years after it was really down. Conversely, if a city was riding high, had entered the “global” leagues, is it safe to say, ten years later, that it has fallen from greatness. Perhaps in your next installment, as you move from looking over the decades, from the late 70’s to the late 90s, and then from the 90s to the 2010’s, the real story will be that Chicago fell much of the time after the mid-century, used the 2000’s and credit to buy its way back up for a while, and then fell to where it had been headed. Is that not much of the story of America, that since the 1970s we’ve known of our weaknesses in infrastructure, education and other public services, that for a time we financed shiny new toys like Millennium Park, and that now that the bill has come due on these and other things, we don’t have the money to provide the really important basics. I first visited Chicago in 1983 and was taken with the near North, the West Bank Club, the Miracle Mile and all the other great places that higher-income people frequented. At the same time, I had a kielbasa near Comiskey, saw the tires for sale at the Saturday markets on the south side, witnessed the poverty around IIT, and looked at the empty Western Electric factory in Cicero. I wondered then, and still wonder, what the program is for getting the poor latch key kids of the south side out of poverty and into the 21st century economy. Can any city really “make it”, when so much of its population is not able to compete? You mentioned that one of the goals of writing this piece was to correct the portrayal of Chicago by the national media. I have always wondered myself how the national media can have such a positive view of a city with as many problems as Chicago. Granted I love Chicago and I went to college there, but I got the sense that people (locals, and the media-national and local) there could very easily overlook the city’s problems to an alarming degree. I theorize to some degree that the overwhelmingly positive picture of the city portrayed locally-especially by the city government-played a critical role in attracting the national attention. I am conflicted about whether to be jealous or grateful. I currently live in Kansas City and in a sense we kind of have the opposite problem as Chicago. There is no question we get our fair share of fluff pieces, and our city is ranked highly often, but it does not happen nearly as much as I think it should. As I said, I believe that local attitudes (especially in the media) play a critical role in attracting national attention to a city, yet in Kansas City, our media constantly acts as though Kansas City is a second rate prairie town. I am honestly surprised that Kansas City gets as much positive national attention as it does-which in my opinion is a strong testament to the city’s potential. Not only does our media have an irrationally negative view locally, but even worse, they tend to have an irrationally positive view of other cities, creating a seemingly inescapable inferiority complex. More recently, when the city gets positive attention local news articles and blogs have actually tried to contradict the attention, I have never heard of such a thing. Another attitude that seems to be abundant is “well we love Kansas City but it will never be like city x, city y, or city z.” Usually the cities x,y, and z are all very prominent cities. When a Kansas Citian says this they are not merely saying that the city has KC has its own unique identity and that we should not try to be like other cities, rather they are implying that we are not as good as those cities. It is hard for me to imagine how someone can “love” a city with such a pessimistic viewpoint, but that is another issue. With all of this I am left wondering how much positive national attention we have missed out on because of this attitude. The local media in New York is portraying the city as the next Silicon Valley and, naturally, the national media has unquestionably accepted this position-though a little more research would lead one to the conclusion that this is not nearly as clear cut. Still, it angers me so much when I see other cities basking in the sun merely because they first gave themselves positive attention. Having an overly-optimistic view of a city might be dangerous, but having an overly-negative view can be just as damaging. The unacknowledged self-interest and self-image of those who report on metro areas is apparent to me. Members of the media elite have no trouble praising a metro they don’t live in, if they don’t feel they aren’t missing out on something in the metro in question. They feel comfortable in praising it in a mildy patronizing way. On the other hand, if they observe a sizable professional class in a metro and imagine that the metro may offer something that they are missing out on, they become more critical and hard-edged to reassure themselves and their professional class readers that if they don’t live there, they aren’t really missing out on anything and that they shouldn’t feel bad for not having considered living in the metro in question. Kansas City would be the former and Chicago the latter in my scenario. As such, I think Chicago’s elite has done a good PR job for the most part. That they’ve gotten the New York, D.C. and L.A. based media to ignore the abandoned post-apocalyptic areas of the south and west sides along with the poor job numbers and to highlight the redevelopment efforts of downtown and the north side. It seems to me that Chicago is more media savvy than some have suggested. Chicago was a great town when we could boast having over one million Poles. Now with three million illegals what would you expect? Members of the media elite have no trouble praising a metro they don’t live in, if they don’t feel they aren’t missing out on something in the metro in question. I think this is a quadruple negative. No. Don’t. Don’t. Aren’t. I read your other article about media centers, and I think you are right and that makes me even more concerned about what an especially negative local media can do to a city’s reputation. If the national media gets very limited information about a city, where are they going to get it from? The local newspaper. I read an article recently–that you were quoted in–mentioning how the Pittsburgh media’s emphasis on the “brain drain” sends a message to people that “we are losers don’t bother coming here.” Well no one sends the message of “we are losers” to the world quite like the Kansas City media. With that I am surprised at the amount of positive national media attention the city gets. Nevertheless, I wonder how much more we could get if only our media was not so down on the city. I know “the media” is notorious for its negativity, but even by that standard, it is bad. There seems to be this bizarre groupthink in KC where the newspapers, the blogs, and the TV news all think very similarly. I have tried to find some diversity of opinion to no avail. The only difference between them is how much they think the same thing–which is basically how bad things are in Kansas City, compared to the lands of happiness elsewhere. I do not know how the newspaper, for example, can simultaneously complain about how we are just not good enough when a convention leaves the city because there are not enough hotel rooms near the convention center, but also chastise the city whenever it wants to update the convention facilities. To me, you can’t have it both ways. The newspaper in this city almost never recognizes anything positive said about the city on a national level (contrast this with some cities that will seemingly write an article about every insignificant positive ranking). Even more astonishing to me is that there have been a number of times, especially recently, where bloggers or columnists at the newspaper will actually rebut something positive that is said. I find this truly stunning. You can tell by reading the articles that the authors quite often have the most pressing anger–it is as though they are threatened by the positive mention. They just cannot allow it to stand, how dare they say something good. One former columnist at one of our papers even went as far as to write back home from New York to dispute a positive piece. I am wondering why he does not spend more time focusing on the problems in New York. I know this all sounds really bizarre, but it is totally true. What worries me about our media is that they focus so much on the bad–sometimes they only focus on the bad, at the expense of many more great things happening. People really get the wrong impression of the city when they read the paper. I believe that if you want your city to be thought of more positively on a national level, the change begins at home. I do not know much about the history of Austin or Portland–smaller cities that gained a positive national reputation–but I would bet that before they were known nationally as places to love the local media first praised the city and then the national attention came. I really get a kick out of how the biggest naysayers in the city will often have a sentence in their columns to the effect of “I really love the city, but … (the conclusion of the “but” is that basically we are losers).” To me that is a very strange way of “loving” the city, but that is just me. What I see in Kansas City is not merely bad news that, for example, exposes corruption, or tells a truth that might be unpleasant to hear, it is just negativity for negativity’s sake. It does not further the city in any way. I think there is an explanation for this. Journalists, if they’re fortunate enough to have job in major market like KC, attended schools with a national student body and a national/international faculty. They consider these people their peers and value their opinions, not those of local professionals. They are angry that they had to accept a good job in an unprestigious location. They hated telling their advisor and classmates that they accepted the offer in “Kansas,” which is practically synonymous with “fly over.” Admitting there is anything good in KC goes against the opinion of their class and they are too proud to do it. I work in academia in a similarly unprestigious midwest metro. Faculty coworkers bond via comiserating about how much worse the area is vs the coasts or Chicago. They rarely acknowledge the good along with the bad. Looks like you are recycling this argument over again. Why isn’t Chicago performing like it did in the 1990’s? Why didn’t it keep up with New York after 2000? And I’m sure you’re going to show employment data for Chicago from 2000-2010, demonstrating that Chicago slipped behind. 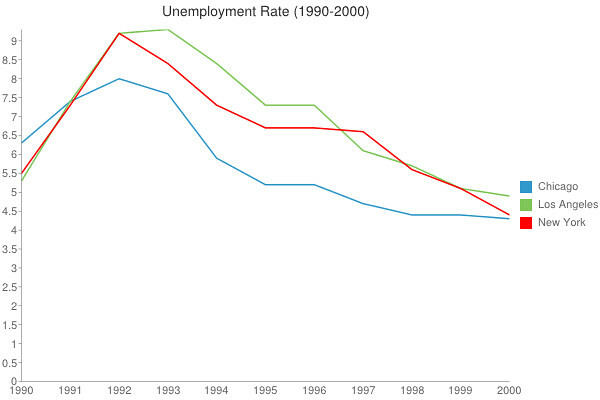 However, if you look at unemployment rates from 1990-1992, New York was actually doing better than Chicago. Chicago then had a surge up until about 2000, when New York closed the gap again. It was a great ride for Chicago. 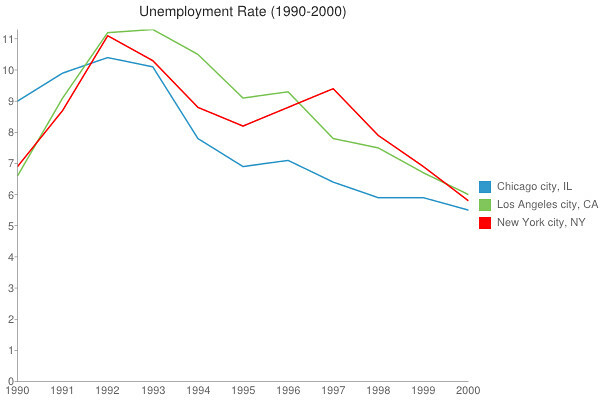 Fast forward to now, and Chicago has all but closed with gap with New York on unemployment rates. Problem is, this continues to be a Chicago vs. New York thing for you. Why aren’t you questioning LA’s “global-ness”, when it has performed the most poorly out of all of the biggest cities for the past 20 years? TUP, the “why” question is a good one. I plan to address it in a subsequent post, but the core of most of the arguments are in previous writings I’ve done. Stay tuned. I may do a Chicago v. LA post because I think there are some differences. I think LA’s problems are largely self-inflicted, with some drag from the “lifecycle curve” of absorbing a huge group of new immigrants (this will fix itself over time). Chicago’s problems, apart from the financial issues, are largely structural. LA has huge structural advantages has perfect weather, is a legitimate global power house in entertainment, has a great geographic location to position it as an Asian gateway (such as the ports), is close to some of the highest value agricultural land in the US, is near significant natural resources, etc. This is true of Chicago as well. I also think momentum and media exposure plays a role as well. Everyone is well aware of IL and CA’s huge financial problems, but the national and local media has portrayed Rahm Emanuel as a fiscal belt tightener who is luring high end professional jobs back to his city in droves, and is slashing the red tape and investing in public transit like never before. Aside from the LA Metro expansion, we never hear anything in the national media about Villaraigosa’s efforts to make LA more business friendly. Seems as if Chicago has the storyline momentum on this- partly because Rahm’s communications team is very “DC” and “Obama Campaign” and knows how to work a news cycle. Rahm is the second most high profile mayor in the country, after Bloomberg. And probably just one of three or four who has the ability to consistently make national headlines. We’ve heard plenty of stories about manufacturing making a comeback in the rust belt, but in the largest industrial center in the country (LA), no such comeback. And California continues to have one of the highest unemployment rates in the country. I think an LA v CHI comparison would be really neat and fascinating actually, more so than NYC v CHI. It’s interesting that people here mention Chicago being “media savvy” and creating positive national attention for itself despite its problems. Because, come to think of it, LA may actually be the most extreme example of this. Despite LA’s miserable employment situation, relative paucity of Fortune 500 headquarters, and lack of importance as a financial center, nobody here questions LA’s role as a global city the way they do about Chicago. I find that odd. One obvious conclusion is media portrayals of the city. It’s one of the world centers of media and film-making. Tom Cruise lives there. It’s LA, after all, with all the glitz and glamour. But when you scour the numbers, you see something vastly different. LA (city proper) continues to grow (thanks Mexican laborors! ), but for the most part it suffers much of what Chicago does: net domestic outmigration, deindustrialization, a State in a huge deal of debt, etc. Thanks anonymous. Are you an English teacher or someone interested in urban development issues? 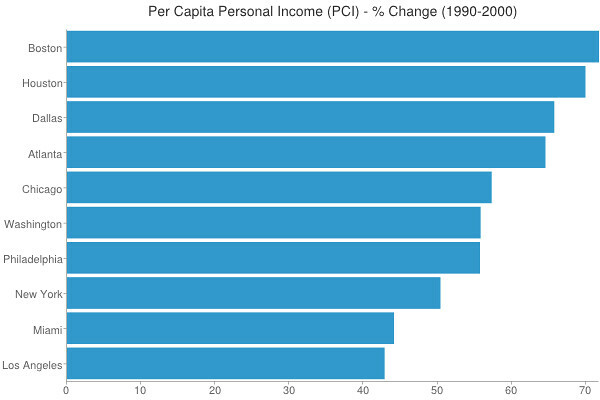 LA had positive real per capita income growth last decade. Anon, I think you might be on to something there. But I also notice that many of the people with this point of view tend to skew older-I don’t think there is a single person writing columns at our paper that is under 40. Further, many of them have been in KC for at least 20 years and, coupled with the feelings of inferiority that you describe, have a sort of fixed image of the way things are, no matter what changes. I was questioning though why many of the political blogs, many written by locals, are so negative. I wonder if, perhaps, these blogs-because they are featured in mainstream media (which already has the same negative opinion)-get a lot more attention than they otherwise would and, in the long run, become legitimate news sources. So, in essence the blogs they feature reflect the image of the city the writers at the mainstream papers see, the blogs, because the columnists treat them as sources, become popular and then the pool of negativity expands. What is even more baffling about the phenomenon I describe in my posts is that I just got done reading the updated version of the “Rise of the Creative Class” and KC does well in almost all of the measurements-something that many other Midwestern cities cannot claim. I know that the media is absolutely enamored with the creative class, but this type of person already exists in abundance in KC, so why are the columnists still so cynical? That is a good question. The good news is though the situation is getting better, but slowly. Like many newspapers ours has had to lay off many people, including some of the most negative writers, which has helped water down the attitudes there. I know many people lament the downfall of the local paper, but if you knew just how bad they were before you would understand why I cheer it. Our Alt Weekly, usually the source of much pessimism has gotten new writers, and there are many more examples of this situation improving. Hopefully this will continue. I also forgot to mention the fact that there seems to be a new and younger group or writers and entrepreneurs in this city that are absolutely on board about the virtues of living, working, and playing in KC. Hopefully, with time, these people will gain more prominence and replace the old guard in our media. LA is not as weak as some assume. LA’s income growth has outpaced that of the nation over the last decade. Its population growth has outpaced basically everyone during the same time period. And, even in the 1990’s, things were not so grim as advertised. The job numbers cited here are by MSA, I assume. 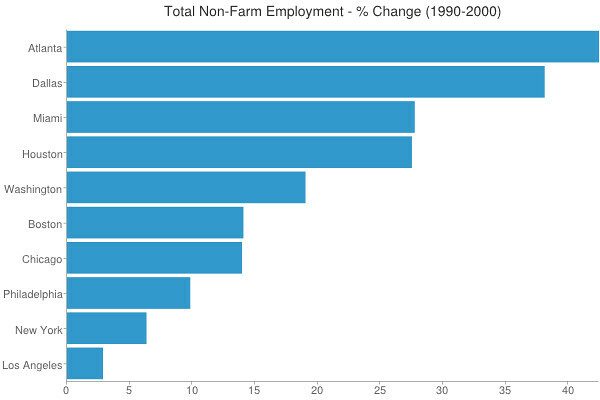 There was strong job growth in the LA CSA, but not so much in the MSA (which had a big legacy defense industry). I would say that, overall, LA is in signficantly better shape than Chicago. It’s better positioned globally, bigger and faster growing, and simply has a better reputation among the “common man”, whether in Muncie or Bangalore. I see nothing that supports your assertion that LA is in better shape than Chicago. Besides population growth (which is not irrelevant, but I wouldn’t consider that a relevant indicator of a city’s economic importance), this assertion sounds more like “gestalt” than anything else. It’s the same old story: the weather, the cache, the Kardashians. But behind that, where are the outstanding numbers? This is not to say that Chicago isn’t performing more poorly than LA in many areas: Chicago’s weather is worse. It has more murders per capita, and while the metro is growing (faster than Metro NY did, btw), the city proper has lost population. But Chicago is also doing better in some ways: more and more companies are becoming attracted to a bustling “Manhattan-esque” urban core in a way that LA will never see, its role in finance, services, etc. My point isn’t to turn this into a Chicago vs LA thing. Instead, it’s to point out that Chicago tends to get picked on a bit more while LA for some reason is being given a “pass” despite its really poor performance on so many indicators. LA and Chicago may have some superficial similarities but economically they are worlds apart. If California is the world’s fifth largest economy, LA is something like the ninth. For all of its problems, it is an economic powerhouse, just as Chicago was up until about 1980. The Inland Empire (Riverside County, etc.) is a wreck, but the west side is growing again and the industries there, particularly entertainment, are exceedingly strong. Name a country in the world that competes with the U.S. for movie or gaming sales. Now throw in defense, toy design, fashion design, auto design, nutraceuticals, and a whole host of other industries and you’ve got a relatively robust place. A sprawling, ugly, disorganized mess, but still robust economically. $735 billion versus $535 billion GMP. Not “worlds apart” at all. 20 Fortune 500 companies for LA and 29 for Chicago. “Nutraceuticals” versus arguably the highest amount of medical research on the planet? Not to say that Chicago is obviously beating LA, becasue it’s not, but again, belittling an area as strong as Chicagoland is silly. What with outsourcing, the number of Fortune 500 companies is an outmoded measure of economic strength, as is, for that matter,the concept of bigness. Exports are what really matter, and the wealth or income they bring into the region and nation. P.S. It is not be-litting Chicago to say that it has a smaller economy than L.A. It is simply a fact. You didn’t say it was simply smaller, you said they were “worlds apart”. The population estimates are good news. There’s no doubt Chicago had gotten a lift recently. I attribute it to the same factors I outlined in my piece. The overall macroeconomic picture has improved. Also, Midwest manufacturing has rebounded sharply, with a few hundred thousand new jobs. As Chicago’s economy is geared to servicing this sector, it was come back with it. The real danger to Chicago (and many other places) is that when we get some semblance of normalcy economically, the urgency of changing the status quo will be gone. And what are the respective populations generating that GMP? A clarification: The Midway (Orange) line opened in 1993, but planning began in 1979, and construction began in 1983. 12.9 million people in LA and 9.5 million in Chicago, roughly. So per capita of $56000 give or take $1000 in both cities. LA is most certainly higher per capita, but not by “worlds”. Can we please stop this silliness and just admit that Chicago is not functioning as some sort of failed outlier among rich US metros. It’s actually a bit absurd that we keep having this discussion over and over and over again. Chicago, city proper, obviously underperformed in many ways between 2000-2010. That is verifiability true. The metro area, however, did quite well or at least fine – more population growth that NYC and LA, tons of business investment, oftentimes the most of any metro. Chicago, city only, had greatly over-performed for the previous decade, so some pullback is not the end of the world. My critique all along has been that these essays/exposÃ©s give the impression that it’s reasonable to argue that the economies of, for example, the LA and Chicago metro areas have diverged so completely that one is now “worlds” better/stronger than the other. But that’s just utter nonsense. No organization that looks at the multitude of data on these two cities has found that Chicago is so weak as to not even be in the same category. Instead, it is often found that the two are fairly similar when everything is taken into account and many times Chicago comes out on top. It’s perfectly reasonable to say that LA is a more important metro – it has considerably more people after all, but then to go on to conclude that Chicago is not even similar on a per capita basis is laughable and demonstrably incorrect. Writing about Chicago as if it has no strengths, only myriad weaknesses, does quite a disservice to the truth. I understand that much of this was done in an attempt to counterbalance perceived over-optimism or puff writing in other quarters of the press, but I’m not sure it’s working. Chicago’s population also increased from 2000 to 2009. Then by 2010, when the Census Bureau had to switch from the best available statistical methods to the methods that Congressional Republicans approve of, the population miraculously dropped. Alon, are you implying that Chicago’s population in the 2010 Census was some sort of political maneuver? Isn’t a large contributor towards Chicago’s population drop the tearing down of the old CHA high rises and the gradual migration to outer-ring burbs and further out? On top of the demolition of CHA units, the vacancy rate of the exisiting units is 20%. Anyone who works with CHA knows this. It’s interesting that you mention the CHA vacancy rate. I was part of a discussion about this topic last night. With crime as bad as it is in the city right now, I assume the city is purposely holding these units off line to force CHA voucher holders to move to the suburbs or out of state. 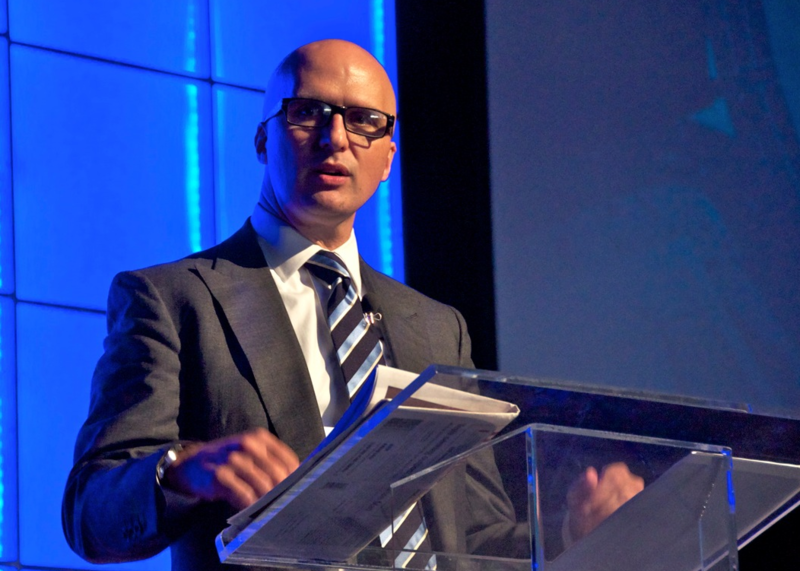 The city cannot continue to go in the direction that it has over the past decade. The CHA voucher system has increased crime throughout all of Chicago’s neighborhoods and Mayor Rahm Emmanuel knows that limiting the number of CHA units in the city will play a major role in reducing crime as well as unnecessary wasted money footed by the tax payers. Aaron Renn, I encourage you to do a write up on crime in Chicago and how it economically stunts the city’s growth. I live in West Garfield Park and you know we’re only 8 minutes from the Loop, 5 minutes from Oak Park, we have the best transportation in the city, we’re near the United Center and the West Loop. We also have the largest concentration of greystone buildings in the city, beautiful Garfield Park, The world famous conservatory and an array of industrial buildings that could be converted to useful space for all purposes. If we could eliminate open air drug dealing and gang-banging on the westside, Garfield Park would be a bustling section of the city, saturated with entrepreneurs, small businesses, start-ups etc. It would have it’s own unique personality and quite possibly be one of the rare areas of any city in america that would have a huge number of minority owned businesses. This has to be very frustrating for Rahm. I do believe this is an intentional dismantling and removal of public housing from Chicago. The units that are being built in the mixed income communities have mcuh higher standards for the residents than the old properties (drug testing, job training etc). They have higher vacancies in the public housing units than the market rate units in those communities as a result. I do think you are blowing the crime thing a bit out of proportion. The bad neighborhoods are having a worse than normal year essentially. There is no uptick in crime in most of Chicago. It’s interesting to hear you see CHA issue the way I do. I wasn’t sure whether it was my assumption only or not. However, I gotta stick to my crime analysis. What neighborhood do you live in? I think the city is out of control. Remember, most people are only aware of what the news reports. My job allows me to travel the entire city all day, every day. Much of what I see isn’t reported. Drugs are Chicago’s biggest downfall…crime wise. Even more than gangs. Crime travels and crime has no boundaries. I hope the city puts the clamps down but until the problem is forced out of the city crime will only continue to get worse. Of course my neighborhood is horrible in regards to crime but looking at my lastest tax bill, I’m sure another wave of home owners will be forced out of the city. Not even 5 hours after our conversation regarding violence in Chicago, 12 shootings have taken place throughout the city INCLUDING the “so-called” safe Northside. These are only crimes that made the news by the way. 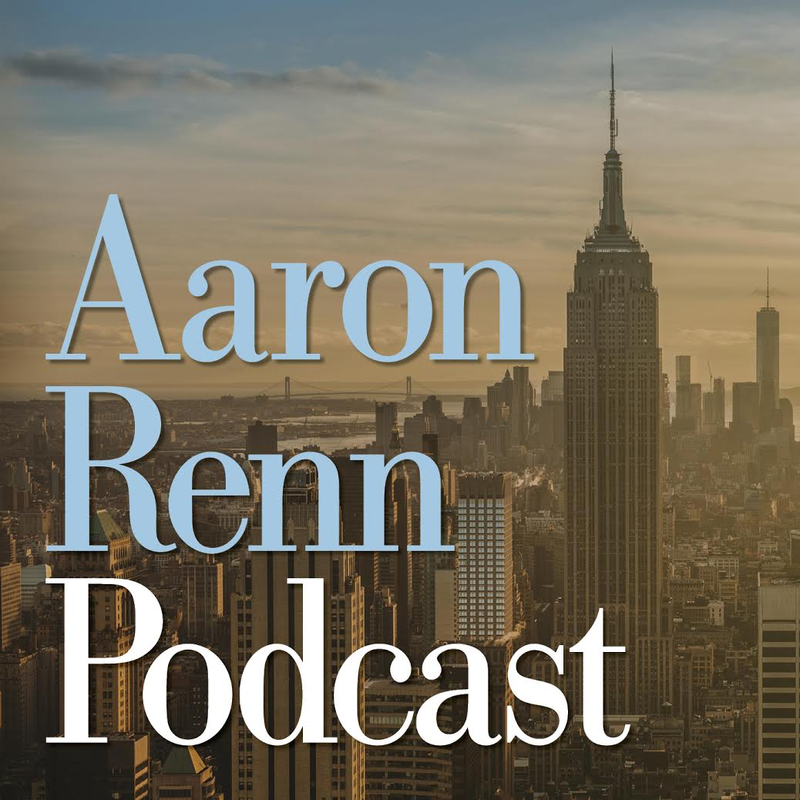 Hey Aaron Renn, I think you have your next story here…? I am very much in agreement with your point about the tax bill. I own investment residential property in Chicago, and I was astounded, just astounded, by my very high property tax bill. This isn’t just high, it is criminal. There is no way Cook County can expect people to stick around with bills this high. We will certainly see another exodus of homeowners with what they are trying to pull.